The Graphtec CE6000-60 vinyl cutter sets the standards for high performance cutting plotters. It features professional level functions including registration mark sensing, SmartFeed™ auto material pre-feed function for enhanced media tracking, and has more punch with its 450gf cutting force. And as it is a Graphtec you get exceptional build quality and reliability that is all backed up by a 2 year on-site warranty in the UK & Ireland. Designed to help you grow your business without a big up-front investment; to deliver professional results to your customers each time, every time. We have put together an exclusive package to offer you the CE6000-60 at an exceptional price along with a huge pack of supplies to get you started with your new cutter. 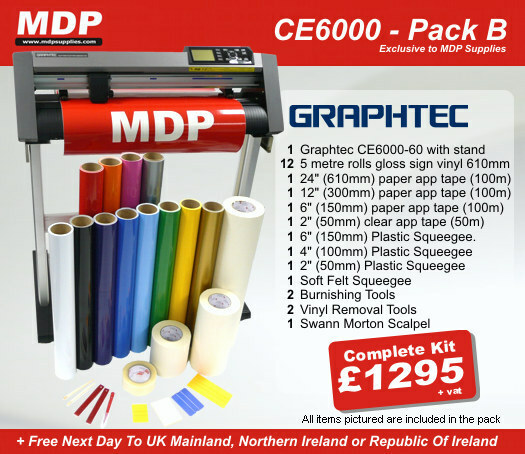 For just £1,295.00 you get everything that is shown below including a 12 pack of gloss vinyl (60 meters in total), a great tool kit and a range of paper and clear application tapes. Film types Self-adhesive vinyl film, fluorescent film, commercial grade reflective film, polyester film. If you do not have Adobe Acrobat Reader installed on your computer you can download it by clicking the link below.